Why am I writing about The Art and Science of Food Marketing? Because I recently sat in listening to food organisations giving evidence to the Senate Select Committee into the Obesity Epidemic about how it is their job to provide parents (consumers) with choice, and it is our job as parents to make better choices. Their position is there a place for these foods in a balanced diet. I can honestly tell you, it was so hard to sit there and bite my tongue. I 100% agree it is a parent’s responsibility to make food and beverage choices for their family. However, these organisations total lack of acceptance of the role they play in the choices parents are making really annoys me. The art and science of food marketing plays a massive role in what parents are choosing to feed their family. Parents right around Australia have shared with us just how difficult it is to say no to these foods in light of the pester power created by these foods, and what their child’s friends are eating (no-one likes the idea of their kid not feeling normal). Then there are the messages about how busy, time-poor parents need these products because they are convenient. Oh, I could go on! But, rather than get all hot under the collar about this, I decided to do what I do best – empower people with knowledge. Today I share with you some information to help you navigate (ie. see through) the marketing of food, so you can wield your consumer power by simply not buying many of these foods. Personal trainers and medical professionals tell us that 80% of our health comes from the food we eat, therefore it is important to understand the numbers behind how most Australians are eating. ABS data now shows that 58% of a household’s weekly food budget is now spent on discretionary foods – this means most households are spending over half of their food budget on foods which are not needed for health. (In fact, many of these foods have been shown to take away from our health.) Personally, I think this ABS study is really telling us how effective food manufacturers are at practising the art and science of marketing! Given these numbers, it is fair to say most Australian children are not eating a balanced diet. They are eating a diet of largely discretionary foods, with small amounts of the foods their bodies need for health. What’s on our supermarket shelves? Combine these stats with the ABS data that 58% of a household’s weekly food budget is now spent on discretionary foods, and is it any wonder this country has a health crisis? Depending on what you read, and where you read it, it is said that marketing is both an art and a science. 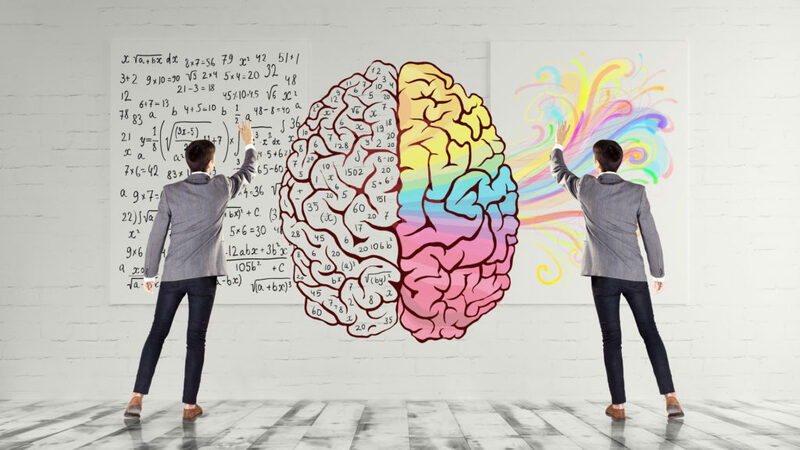 The “art” part of marketing is the side which looks at shades of human behaviour, and creating an emotional connection with the consumer. The “science” part is the more analytical side, which looks at the strategies to optimise consumer activity and spend. The combination of the 2 makes it difficult for even the most astute consumer to navigate the enormous amounts of products on the supermarket shelf. To help you navigate better, I want to share with you a few techniques (tactics) used in the food industry so you can easily recognise them for what they are. I hope you can learn to see them for what they are, laugh at them and move on (ie. do not buy them). 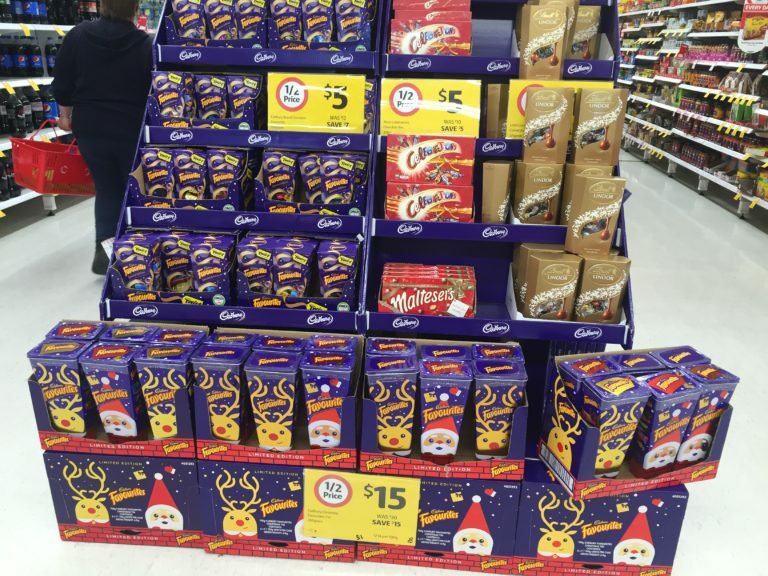 There is definitely a science to the layout of supermarkets and their promotions. Have you ever noticed how when you walk into the 2 major supermarkets in Australia, you enter from one side, and that there are usually specials near the entrance? Yep, there’s a science to that: the specials tend to be items with a higher margin (ie. that the supermarkets will make more money on) – or that the food manufacturer has paid extra $ for, to place at the front of the store. Product positioning is another important marketing science. 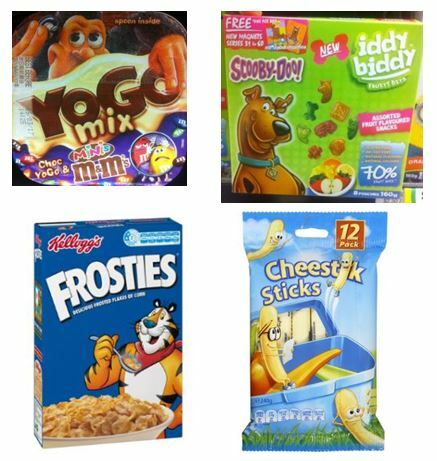 Have you ever noticed how foods like Tiny Teddies are positioned at the eye level of kids from toddlers to 7 year olds? And biscuits like shapes are at the eye level of slightly older kids, and those packets of noodles with flavour sachets are at the eye level of tweens and early teens? Then energy drinks and soft drinks at the eye level of teens? This is not a coincidence. There is a whole other level of positioning around brands, too. I recently had a discussion with someone who is a manager at food manufacturer which has over 10 lines of products with the 3 major supermarkets. His company was approached by one of the major supermarkets who said they were looking at reducing the number of brands of a particular product range, and requested a $100,000 payment in order to keep their brand on the shelf. I won’t even go into the rest of the negotiations that went on, but suffice to say I was blown away. 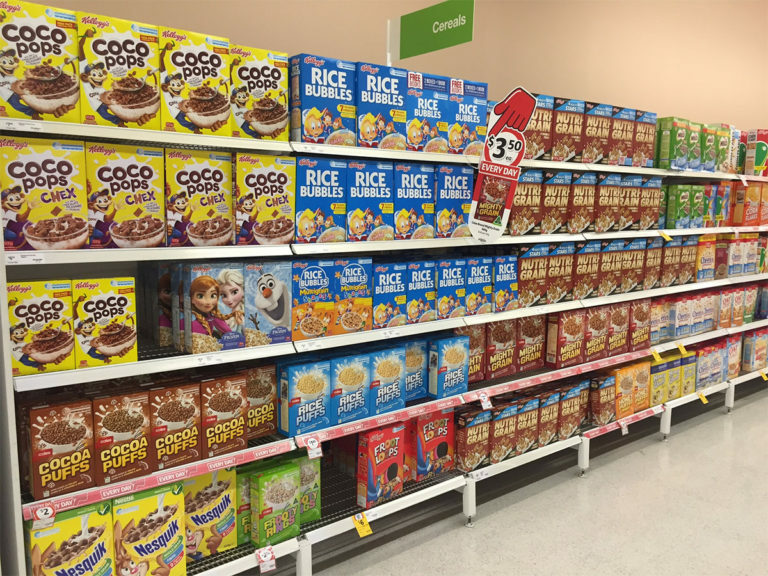 I started doing some research and found this article called Shelf Importance which was eye opening – I suggest you read it to get a great understanding of just how much science is involved with how products and brands are marketed within supermarkets. RED – gives a sense of urgency. Is often used by fast food outlets because it encourages appetite, builds excitement and passion. YELLOW / ORANGE – happy and friendly colours. When combined with red, they give the feeling of speed. Also used to elicit impulsive buys. Yellow is also the most visible colour in daylight (you can always see those golden arches, day or night). BLUE – associated with peace and reliability. Used mostly by conservative brands wanting people to trust them. GREEN – think healthy, nature, strong. Used to relax people. PURPLE – wisdom, admiration, creative. Think about the colours used by most fast food outlets, or the colours on packaged foods. Can you see now why those companies and products are using those colours? You might also like to read this article on the psychology of colour. I’ve written before about the use of characters on food packets for kids before – read the Dark Side of The Force, it explains how characters have a significant impact on pester power of kids. What about the use of our sports people to promote food and drinks too. I can tell you from first hand experience of showing kids sports drinks and hearing them all cheer for them, that the use of Australian sports people promoting these drinks has been a stroke of genius by these firms. Kids look up to these athletes. They see if they are drinking them, then we must need them after we have played sport. Seriously, what kid (or adult for that matter) needs the 9 teaspoons of sugar most of these drinks contain? Then the words used on packets: E.g. lunchbox friendly (only to manufacturers – not to our kids bodies nor the stress levels of teachers), canteen approved, no artificial colours or flavours, 30% less sugar (than what? ), no added MSG and the list goes on. These words, those pictures – all of this is the art and science of marketing. None of it tells you what’s in your food. Turn the packet over and read the ingredients. Everyone loves to think they are getting a bargain. But are you? Why is it this week you can get 2 for the price of one? Who is paying for the other one? Are the supermarkets being the nice guy and giving it away? I doubt it. Have they charged the manufacturer additional fees to do this? Or are we being overcharged in the first place? Interesting questions, don’t you think? What about this question: Do you really need two of that item this week? If you want help learning how to read packet labels, read this article – 5 simple steps to reading packet labels. If you want to help spread the word about how to make better food choices, please share this article widely with your family and friends. We thank you for being a stand for children’s health. Thanks Bel, AMAZING article that I’ve based my next kitchen lesson on!!!! I run a kitchen/garden program & we continually discuss the negatives of packaged foods. I have displays of packaged foods, bags of sugar to represent what’s in each drink & the sheets of all the additives that are in packaged foods on display for the kids to see(at their eye level). We colour code our cooking into green,amber & red foods and the knowledge the kids have gained is fantastic. Thanks for all you do.